Walking down Passeig Lluis Companys towards Parc de la Ciutadella right at the opposite site of Arc de Triomf we find a monument that honors city mayor Francesc de Paula Rius i Taulet. 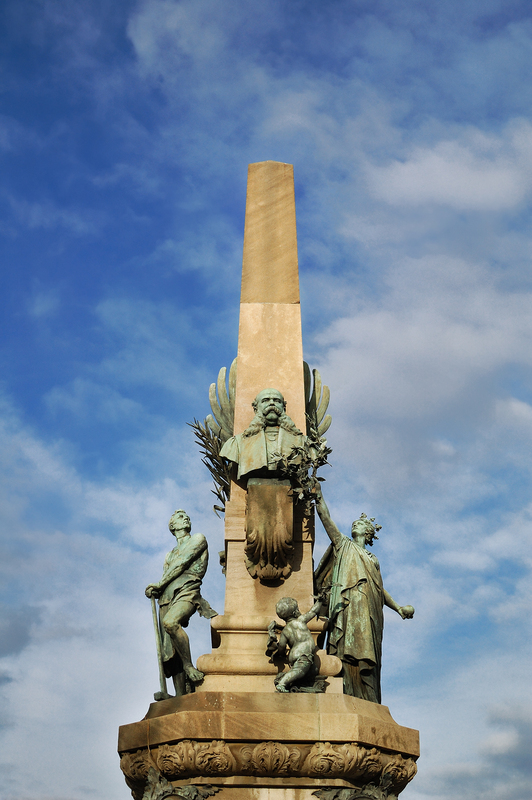 This obelisk was built between 1897 and 1901 by sculptor Manuel Fuxà with the help of architect Pere Falqués. The universal exhibition of 1888 held in Barcelona had a significant impact on the economic, cultural, demographic and urbanistic development of the city and much of such improvement is owed to Rius i Taulet as president of the event and as promoter of many projects started as a result of the exhibition. Notice the man with hammer on his left that symbolizes Labor and a lady paying homage to the mayor on behalf of the city. Beautiful shot and composition. Really nice. Marvellous peice of art! Great shot Carlos!